Jessica Mahoney and her husband Kevin have dealt with the devastating loss of six pregnancies, but the couple was able to turn their pain into a celebration with the help of two photographers. With Jessica expecting her second child after the birth of their son Corbin four years ago, Kevin reached out to photographer JoAnn Marrero (of From Labor to Love) to capture maternity photos of his wife with their rainbow baby, Marrerro said in a statement to HelloGiggles. The result is a work of art that has the ability to give hope to other couples who are struggling with fertility issues. A rainbow baby is a baby who’s born after a family has suffered the loss of “children born after a miscarriage, stillbirth, neonatal death, or infant loss,” TODAY wrote. 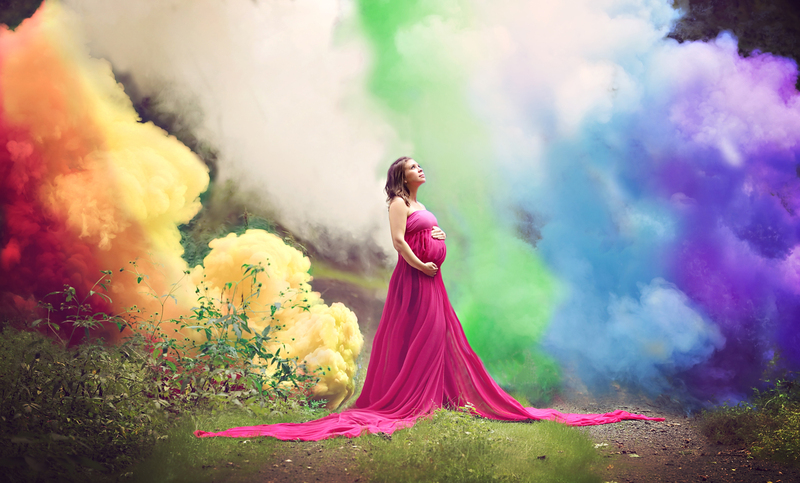 Marrero explained, “Jess wanted something rainbow-inspired because of the many fertility struggles she and Kevin had encountered, and so I knew I had to do something extra special for her family.” Marrero then came up with the idea of using colorful smoke bombs to create a rainbow and along with her mentor Mary Maloney (of Pebbles and Polka Dots Photography), they made this idea a truly stunning reality. "Through our rainbow haze, Jess stood with composure and her pregnancy glow came shining through like the sun. A whole lot of laughter made the moment even more vibrant and brilliant. This was definitely her moment, a proud mother-to-be for the second time." Even the behind-the-scenes photos show how calm Jessica stayed during the photoshoot and also the effort that went into making this memorable and touching piece of art with Maloney visibly setting off the color bombs in the background. "I hope my story helps someone else to know they are not alone, as the journey of loss and infertility is dark and lonely." This mother-to-be has certainly provided a light for others dealing with infertility and here’s wishing that the Mahoneys experience the level of joy captured in this photo for years to come.